Sometimes you just need want to wrap everything in bacon, fry it up, plop down on the couch with Netflix and call it a day..right?!….RIGHT! That kind of day was the inspiration for this little snack, and by ‘little snack’, I mean..uh, not little at all..haha! 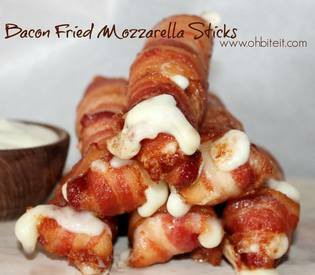 There’s really nothing small about bacon or cheese, especially when you put them together and uhhh..fry them, but sometimes you just have to do it!